Topic: What can AI do for me? Speaking to the puzzled, intrigued and curious. In this interview, really part of a series, we ask what makes an entrepreneurs tick? We ask about the things that make a difference in their lives. We hear about how they run their company and sometimes the personal things that were important milestones in their lives. This one of our ongoing series of interviews on what executives have learned in life. Jill Konrath shared the 5 Most Important Things she has Learned in Business and Life with personal stories from her early days in sales. She covers an early failure that nearly stopped her in the first few months of her sales career. 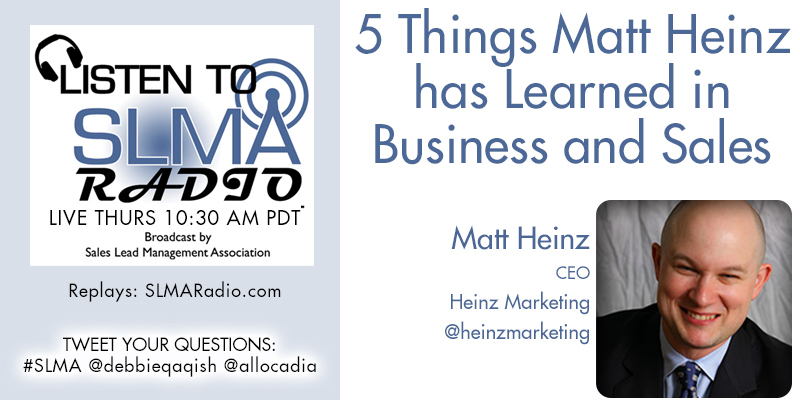 This is one of a series of programs on SLMA and CRM Radio about the 5 Most Important Things in Business and Life that people we respect have learned. Kevin Joyce's interview turned inward and more personal than many. The host is Jim Obermayer. 1. How he came believe in Carpe Diem because of a death of a close friend. "Listening is important," said Lars Helgeson, founder of GreenRope, but when he listened to people saying that what he wanted to do was impossible, he heard an entirely different messages from them. In this interview with Lars Helgeson, CEO and Founder of GreenRope, Helgeson discusses what he learned from listening, rejection, over-coming resistance, and why he needed to build partnership with employees as well as the external partnerships so important in building a business. He also discusses the value of becoming an author and the lessons he learned in the process. Basically it seems Lars learned to walk the talk which has brought him success and satisfaction. This is one in a series of executive interviews on the most important things in business and life. Lars Helgeson has been in the Internet marketing space since 2000, when he co-founded one of the world's first email service providers, CoolerEmail. As a pioneer in responsible email marketing, he grew CoolerEmail to a global software company specializing in marketing communication with over 1,500 clients. In 2010, after spending several years designing and implementing a more comprehensive way to meet the needs of small and mid-sized businesses, he launched GreenRope. I n 2017, Lars published CRM For Dummies, part of the globally acclaimed "For Dummies" series of books. GreenRope is a company built around providing exceptional value to our customers. In the past 16 years, we have evolved from being one of the first email marketing service providers to being the only Complete CRM on the market. Combining sales, marketing, and operations in to a single platform, GreenRope inspires collaboration with your clients, vendors, and employees and we live this collaborative culture, listening to people like you to build what YOU want to run your business.